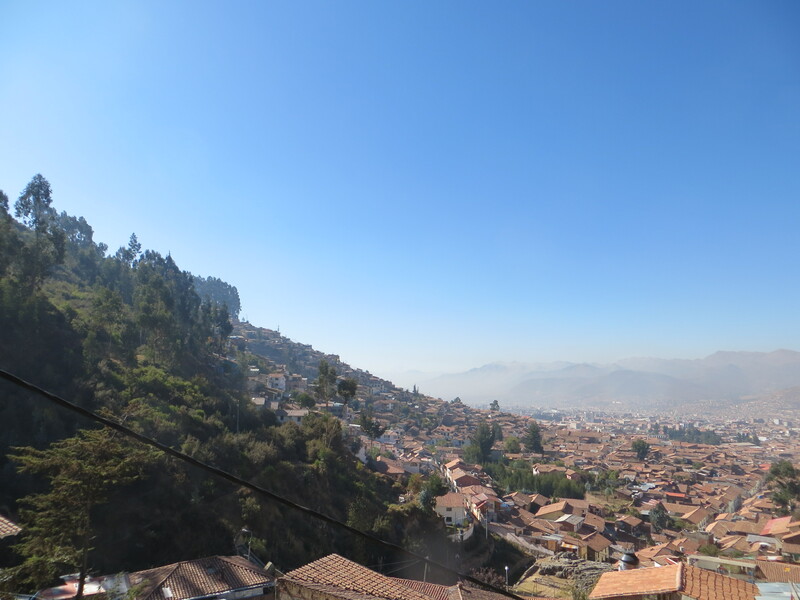 Our earliest day ever began at 4:30 AM so that we could catch our return flight to Cusco on time. Unfortunately, we had almost eight hours of travel before we even got to the airport. We started with another five-hour boat ride via our motorized canoe. As a number of people were leaving simultaneously, we piled into one boat, covered head-to-toe to protect from the cold. With hoods and hats pulled over our eyes and blankets on our laps, we looked like patients in a tuberculosis sanitarium. The boat ride ended in the mining town of Colorado, which reminded me of the non-sanitized version of the North American Wild West. The taxi next to us carried crates of chickens and bags of guinea pigs on its roof. The people working the dock were all tough-looking men, who seemed as if they’d not hesitate to get in a fight if you looked at them the wrong way. I didn’t feel unsafe, but there was a weird vibe that I hadn’t experienced anywhere else during the trip. Appropriately, we left in the sketchiest form of transportation yet. While the vehicle was in good condition, the taxi driver had a tendency to drive on the left side of the road, zipping over bumps and small ditches as quickly as possible. There were a number of close misses with cars, trucks, and motorbikes, accompanied by angry honking on both sides. After an hour, we came to another river crossing. While Peru has some bridges, I suspect many areas don’t bother because the rain during the wet season is likely to wash them out. For example, the major bridge between the towns of Santa Theresa and Agua Calientes (where Machu Picchu is) washed out a few years ago, leaving the town with very limited access to the outside world. This river was particularly shallow and strong, an odd combination. Judging from the piles of rubble and the bulldozer perched atop one of them, mining had substantially altered this river’s natural flow. The sheer power needed to navigate across the river was worlds away from how we delicately maneuvered through Manu’s landscape. We took our leave of Fiorella here, who was picking up another group. We told her how much we enjoyed her company, local knowledge, and interpretation. Even though we were frequently disorganized and clueless, I think she enjoyed guiding us. Another van ride and a plane flight later, we were back in Cusco. We headed over to the ChocoMuseo, part of a “chain” of similar museums. While it was far too late to participate in a chocolate making class, we did read over the well-written exhibits. Peru actually grows far less cocoa than I had thought, although they’ve quadrupled exports in the last few years. Although cocoa is native to South America, African countries now grow the majority of it. Unfortunately, the leader is Côte d’Ivoire, notorious for its labor abuses. Unfortunately, cocoa is not well-adapted for Africa’s soil and climate, forcing farmers to heavily fertilize and irrigate. 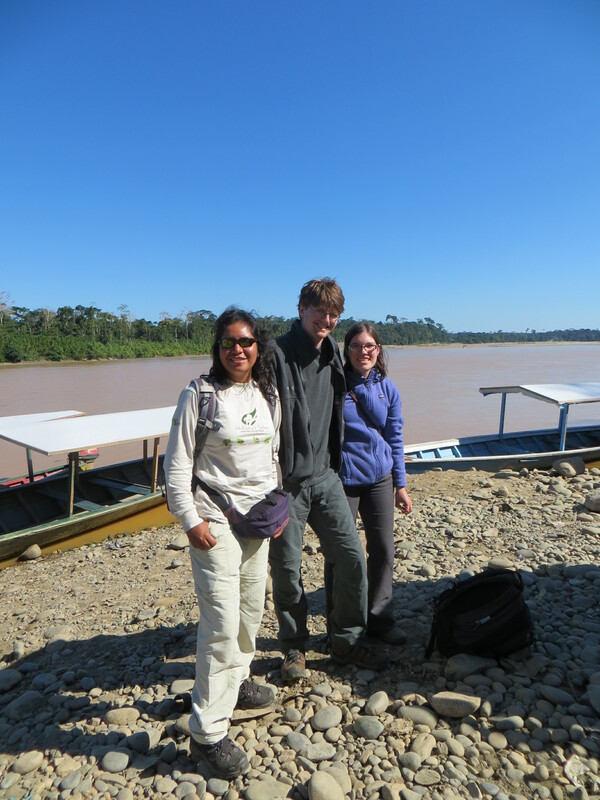 In contrast, the Peruvian ecosystem is perfect for growing chocolate and so requires far fewer inputs. With a growing demand for Fair Trade and shade grown/organic chocolate, it seems like Peru has a perfect opportunity to help farmers switch from growing large plots of coca for cocaine to high-quality, high-paying cocoa. We ended the day with a delightful dinner at Greens, an organic restaurant that wouldn’t have seemed out of place in D.C. Everything from the restaurant owning its own farm to the vegetarian choices warmed my hippie heart. Today was our single free day in Cusco between scheduled trips. I wanted to visit four places – Sacsayhuaman, a substantial Incan ruin just outside of town; Qoricancha, one of the Incan temples of the Sun; the Inca Museum; and the Cathedral. It was only 1.5 miles to Sacsayhuaman and then another mile back to Qoricancha, which seemed like a perfect warm-up for the Inca Trail. We set off from the hotel early enough that the streets were calm and the weather cool. Unfortunately, we discovered that climbing the steep roads to the top of the city was exhausting. We thought we were acclimated after retreating to the lowland, but our lungs said otherwise. We dragged our feet and stopped for breath at the top of every staircase. Thankfully, we were rewarded with a sweeping view of the city at the first entrance gate. From the words “Viva la Cuzco” carved in the mountains to the Plaza de Armes, the city was laid out like a map before us. Unfortunately, we were far from the top. Although the lack of a written Incan language prevents anyone from really knowing, archeologists’ best guess is that the Incas originally built Sacsayhuaman as a religious center for “upper Cusco.” Later on, it transformed into a fortress when Manco Inca, the last Incan king, lay siege to Cusco in an attempt to drive the Spanish out. As both a religious center and a fortress, it was located pretty damn high above the city. When we finished huffing and puffing our way to the top, we reached a ticket booth with no official markings. A man exited, declared we had to pay 140 soles (about $60), and then disappeared with our money. Getting antsy, I seriously wondered if he might have taken us for a ride. After he took his sweet time, standing there chatting with another guide, he finally gave us our tickets. Local people surrounded the ruins, all trying to offer their wares as guides or artisans. Between them and the street merchants, the phrase “No, gracias,” became an automatic response to everyone. After hearing much about Sacsayhuaman, including the reputation as the“greatest Inca ruin outside of Machu Picchu,” I was surprised to see how little of the site remained. However, its limited existence made sense. The Spaniards ripped down as much as possible and local people had been taking stones from the site for years before the Peruvian government protected it. Nonetheless, what was left was pretty damn cool. A series of 15 foot limestone walls zig-zagged across the plain overlooking the city. Rather than using mortar between the blocks, the Incas carved each stone individually to fit together perfectly in the imperial fashion. While it would have been simpler to cut square or rectangular stones, some of their stones have five, six, seven and even more sides. There’s one stone with 32 sides in Macchu Pichu! Many stones had small pieces that locked right in place with niches in a neighboring stone, improving the resiliency of the wall and looking like ancient Legos. For this reason, an earthquake in 1950 destroyed many of the Spanish buildings while the Inca construction survived. We wandered among the walls, walking up the ancient steps to various overlooks. The Spanish probably weren’t that impressed with Sacsayhuaman, considering they had already disassembled much of Cusco, but I wonder if the walk weakened them the way it did me? 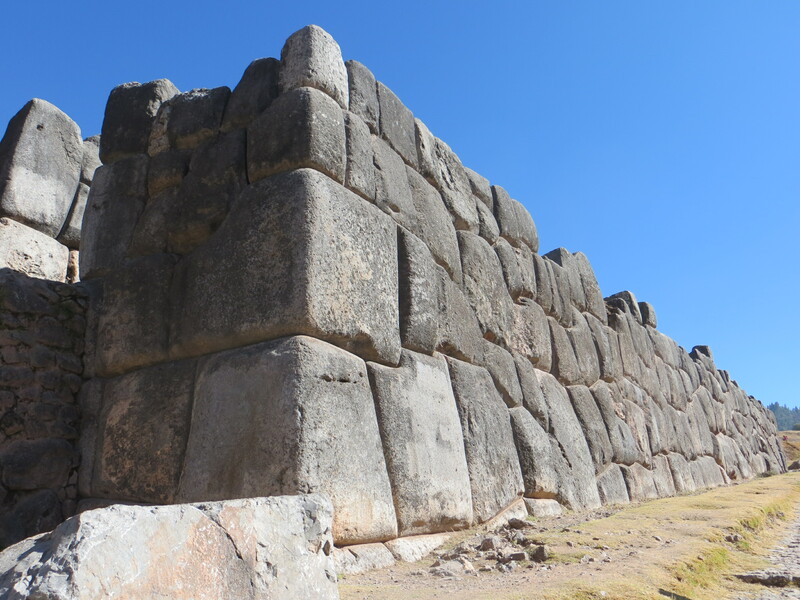 Despite being acclimatized and better equipped than the Inca, these precisely built walls must have elicited some level of awe in the Spanish. 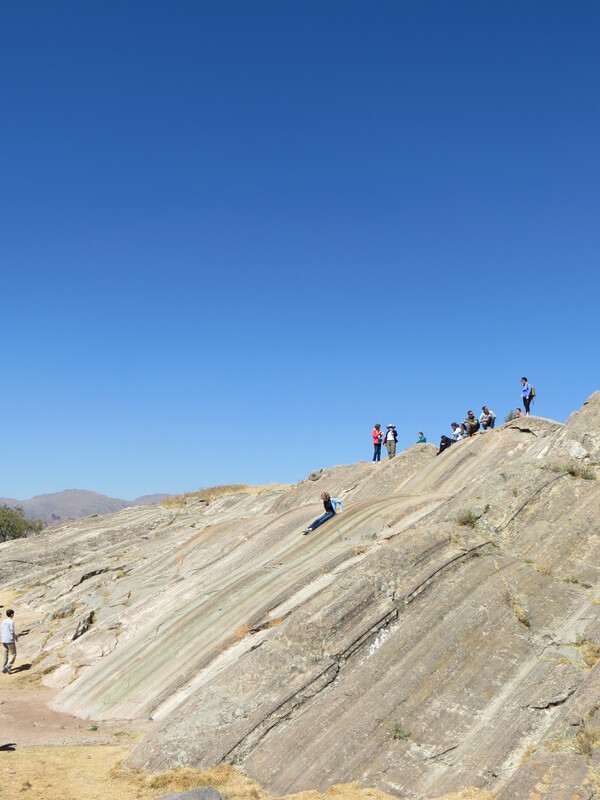 Unfortunately, while the Peruvian government has designated Sacsayhuaman a historical site, they fail to provide any interpretation or guidance. If you wanted any information about it, you better have a book on hand or hire a private guide. The only thing they handed us with our ticket was a cartoon tourist map of the city. In the site itself, we ended up at a dead-end more than once, blocked off from the next section by a rope. The intended route was impossible to discern. From there, we walked down to a huge grassy terrace. 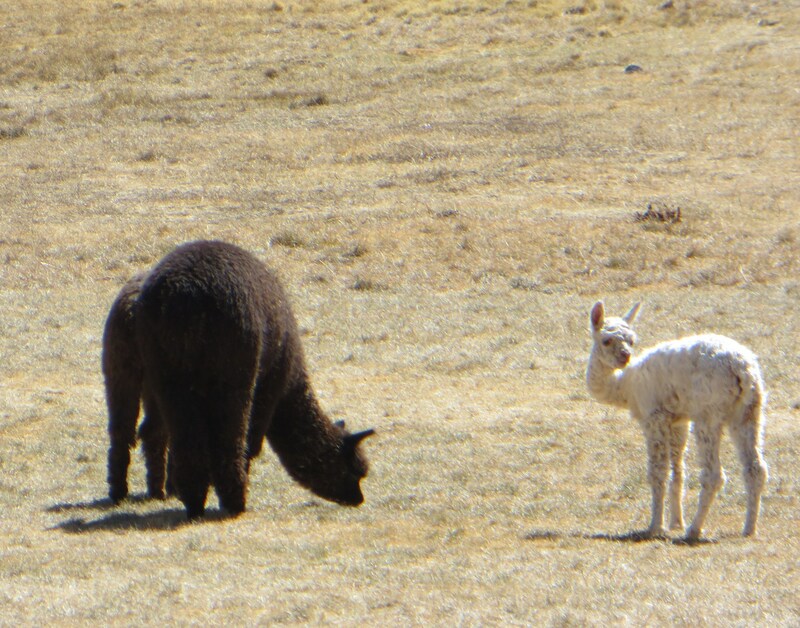 There were a number of alpacas and llamas grazing and one was chasing a neighborhood dog in circles. While the llama seemed annoyed, the dog bounced around in joy. On the other side of the terrace is a multi-step amphitheater, likely used for religious ceremonies. As it complements Qoricancha, it likely focused on sun worship, but there’s not much left to indicate that now. On the other side of the amphitheater is a large stone with a curved depression that overlooks the terrace. Archeologists guess that it was a throne for the Inca to oversee ceremonies or address a crowd. In addition, there were two very baffling features. The first was a very large, smooth, slanting stone with a long indentation on it near the throne. Many tourists use it as a slide, but I’m pretty certain the Incas weren’t interested in incorporating playground equipment into their sacred space. 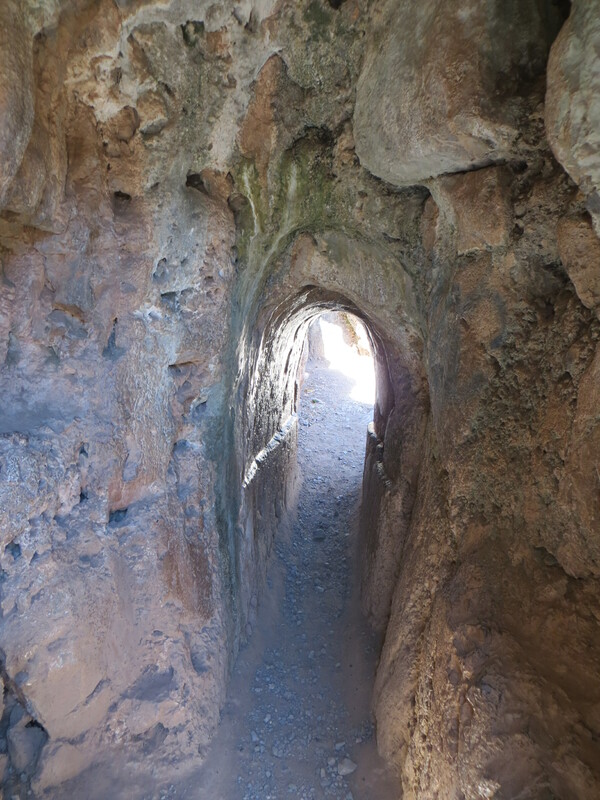 The other element was a series of tunnels and mini-caves that run under and behind the amphitheater. They were roughly cut and unevenly dispersed, unlike the precision displayed elsewhere. Most of them were also a bit too narrow for a normal-sized person to walk through – I had to do some awkward maneuvering to squeeze through. It turns out that I’m not the only one uncertain of their purpose. While our Macchu Pichu guide later said that they made up a reservoir, others think they were a storage area. As the Spanish ransacked the place, it’s likely we’ll never know. While I was ducking through the ancient warehouse, Chris was sitting on a rock with his head between his hands. The vengeful god of altitude sickness had struck him. Although the walk down was much easier than the one up, by the time we got to lunch, he was literally falling asleep at the table. Abandoning our agenda, we retreated to the hotel and took a good long nap. Hoping to squeeze another site in, we tried to walk over to Qoricancha. Unfortunately, less than a block away, Chris’s stomach started cramping. In less than 5 minutes, it decided to make its contents known right then and there. I freaked out a little, tried to warn passers-by, and then slowly helped my sick husband back to the hotel. I stuck with him for another hour and a half to ensure he was okay, and then followed his encouragement to go see at least one more place. Fortunately, the Inca Museum, which the guidebook claimed had the best Inca artifact collection in the world, was still open. With the entrance fee of only 10 sols ($3), my expectations were low, but happily fulfilled. The collection was actually quite good, with a variety of objects from both pre-Inca and Inca cultures. It started with a group of early stone weapons that bore about as much resemblance to useful weaponry as the random rocks my dad would claim were arrowheads when I was a kid. However, the artifacts quickly advanced in both beauty and skill. Next, they had elaborately painted full-size pottery as well as tiny versions for sacrifices to the gods. In addition to the dollhouse-like miniatures, they also had delicate turquoise figurines of people and animals. But the two most memorable sections were respectively, macabre and explicit. The first was a replica of an Incan burial chamber with real mummies. Unlike Egyptian mummy exhibits I’ve seen elsewhere with an isolated casket, this room surrounded the mummies with genuine artifacts. Despite the glass, the dim light helped me imagine that I had just happened upon this tomb, like Indiana Jones. The other notable area was a special exhibit highlighting works on loan from other museums. Fascinatingly, almost all of these works featured pre-Incan erotica, with couples in a huge variety of poses. Although I’m not sure, I think they were drinking vessels for fertility rituals. As Hiram Bingham, considered the “scientific discoverer” of Machu Picchu, mentions this type of pottery, it seems like it was pretty common. While it was nothing compared to what’s available on the Internet today, it could inspire blushing. While the artifacts themselves were fascinating, only about a 1/20 of the explanations were translated into English. I certainly wouldn’t critique them (although others did in the museum’s guest book), but it was surprising in a tourist town. There was just enough there that I could parse the objects’ functions and time periods, but as a museum junkie, I would have been willing to pay extra for information in English. Returning to the hotel, I found Chris awake, appropriately watching No Reservations, and feeling much better. This entry was posted in family, travel and tagged cusco, Inca Museum, Peru, Sacsayhuaman. Bookmark the permalink.